Friends of Players: NRPCA Mystery Theatre Night! 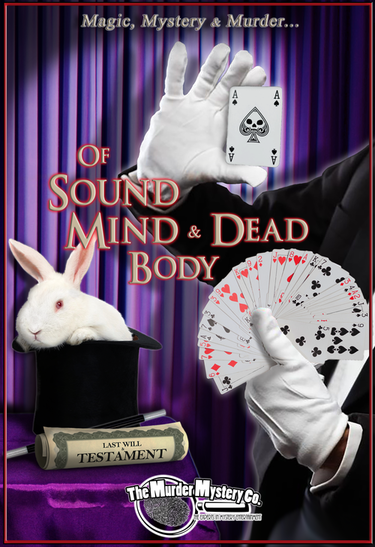 Mystery Theater: Of Sound Mind & Dead Body: Magic, Mystery & Murder When a magical mishap leaves a million dollar inheritance up for grabs, the next trick will be figuring out who the lucky winner is, and who will end up behind bars for malicious magical mayhem! This is an abracadabra disaster, and it’s up to you to find the murderer before they vanish into thin air. Spend the evening glimpsing through the smoke and mirrors to uncover which hocus pocus hitman offed the poor fellow, and stop them before this goes down as the most dangerous magic trick in history. Tickets on Sale for The Odd Couple! Tickets for The Odd Couple are now on sale! 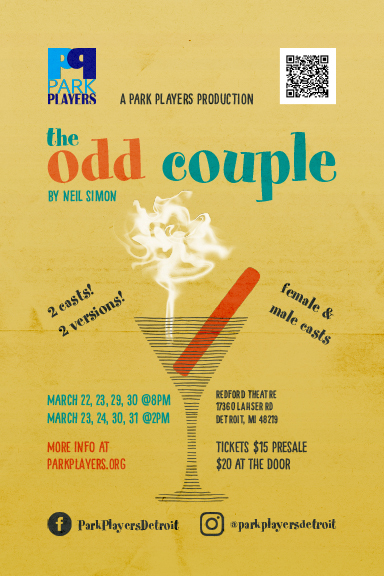 Park Players will be performing both the male and female versions of on of Neil Simon’s most famous works, The Odd Couple. Male Version Performance Dates: March 22 @ 8pm March 23 @ 8pm March 30 @ 2pm March 31 @ 2pm Female Version Performance Dates: March 23 @ 2pm March 24 @ 2pm March 29 @ 8pm March 30 @ 8pm Tickets are $15 when purchased online and $20 at the door! Join us for our annual year-end gathering! Family and friends are welcome! 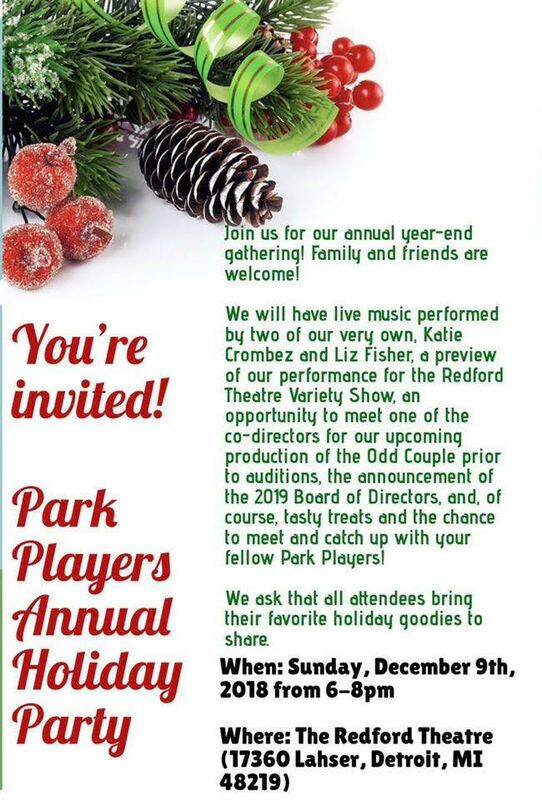 We will have live music performed by two of our very own - Katie Crombez and Liz Fisher a preview of our performance for the Redford Theatre Variety Show an opportunity to meet one of the co-directors for our upcoming production of The Odd Couple prior to auditions (details will be available at parkplayers.org soon!) the announcement of the 2019 Board of Directors tasty treats and the chance to meet and catch up with your fellow Park Players! Angels in America tickets are available! Angels in America Part One: Millennium Approaches Fresh off its Tony Award winning, 25th Anniversary revival on Broadway, The Park Players is thrilled to have been granted performance rights for Angels In America, Part One: Millennium Approaches for November 2018. Helping us to bring this truly groundbreaking work of American theatre to our stage as director will be Joe Bailey, Artistic Director of The Ringwald Theatre. The production team has already been meeting to plan Joe’s vision for the show and now it’s time for everyone else to join in. 2018 marks the beginning of a new era in Park Players history! 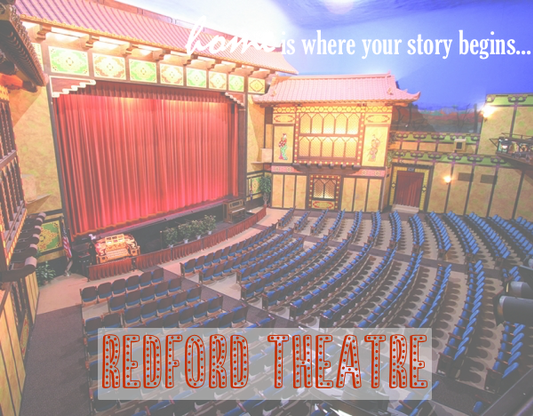 We’re super excited for our move to the Redford Theatre. Make sure to come check us out in our new home! Sunday, December 17 at 6:00pm With our recent move to Redford Theatre, this will be a very special party! Our annual Christmas gathering will be held at the Community House on December 16 at 6pm. We’ll be singing our favorite carols, hymns, and songs around the piano, and Santa will be in the building! Please come join us for a fun-filled evening of joy, celebrating the holiday season, and enjoying the presence of good friends.